Misr International University organized the closing ceremony of the “Market Value of Stocks” competition on Saturday, June 17th, 2017, where four teams presented their valuation reports on Obourland for Food Industries in front of a panel of financial experts who evaluated their work and chose the winning team. 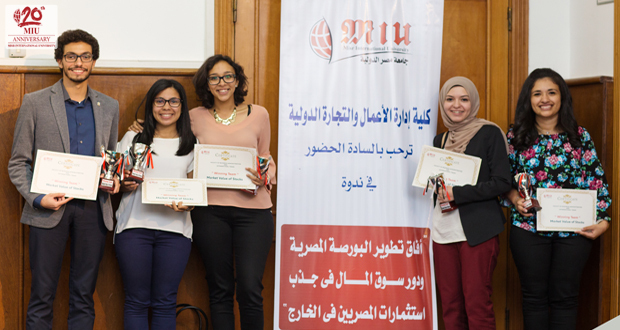 The competition was ongoing throughout the academic year 2016-2017, as MIU business students attended many workshops, seminars and field trips to learn the basics of the stock valuation. 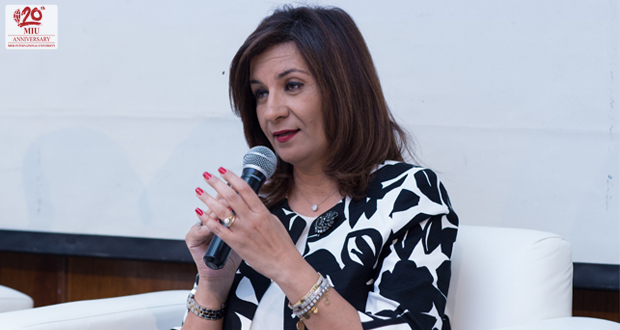 After the closing ceremony, the panel discussion entitled “The Development of the Egyptian Stock Market and Its Role in Attracting Egyptian Investors Living Abroad” was conducted under the auspices of the Minister of Immigration and Egyptian Expatriate Affairs, Nabila Makram. Many leaders in the fields of stock market, investment banking and finance professors and experts were among the attendees including Mohsen Adel, Board Member at the Egyptian Association for Capital Markets Development, Amr Elalfy, Global Head of Research and Managing Director at Mubasher Financial Services, Shawkat al-Maraghi, Managing Director of HC Securities and Investment. 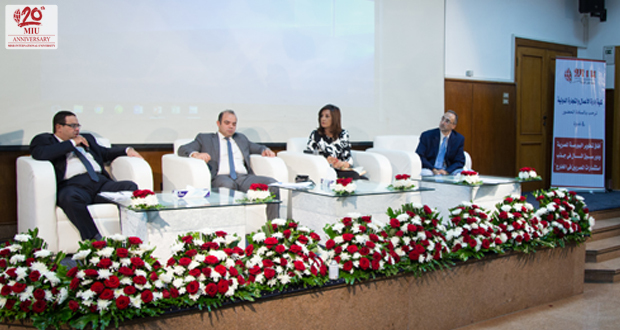 MIU President, Dr. Shebl El Komy and the Faculty of Business Administration Dean, Prof. Tarek El Domiaty also attended the panel discussion. 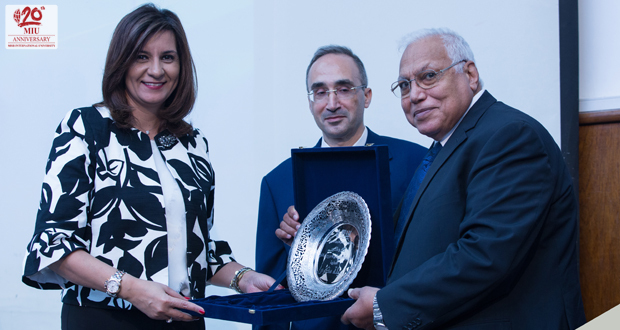 The seminar tackled several issues related to attracting Egyptian investors to invest in Egypt and to benefit from their experience abroad, aiming to develop the stock market field in Egypt. The Minister said that the suggestions and strategies that were discussed in the seminar would be part of her future development plan. At the end of the seminar, the representatives of the brokerage firms expressed their admiration of the quality of the reports that the students presented and offered them internships and possible job opportunities.